The Place Following Jiang-Nan Chun’s major revamp few years ago, One-Ninety restaurant at Four Seasons Hotel Singapore spots a new look last month as well. The all day dining restaurant of the luxury hotel in Orchard Road has a botanical theme now, where there is a fair bit of acrylic flowers hanged on the walls and orchid flowers around the restaurant. It all sounds like a fine tribute to Singapore’s garden city reputation, where I also spotted subtle Peranakan aspects in its flooring and table tiles. The Food Interior look aside, the menu at One Ninety is also largely revamped, with majority being new dishes. The focus is also on Provencal cuisine along with Asian twist. As part of the re-opening promotion, there is a 25% off dinner bill daily, which runs till 30 June 2019. We started with the complimentary Artisan Sourdough, which uses bread from Hokkaido. Interestingly, the bread is served with pickles and a seaweed butter with chive oil. For a start, the Avocado salad with mixed baby Cresses and Miso dressing (S$18) is delicious. You get a generous serving of avocado here and the miso dressing makes the green fruit even more palatable. Another starter I enjoyed is the Lobster and Prawn Toast with Spicy Tobico (S$8). It comes in a crispy spring roll like texture, where the lobster and prawn fillings are delicious. A more luxe alternative to start is the Beef and Caviar with Dijon Emulsion (S$18 for 3 pieces), topped with Ossetra Prestige Caviar. One of the new signature starter is the Seasonal Seafood Tower For Two (S$78), a three-tier display of fresh seafood such as Maine Lobster, Scallops, Prawns, Mussels, King Crab, Spanner Crab and Blue Fin Tuna. The surprise for me is the Maine Lobster, which is in fact farmed in Singapore. The 25% discount till 30 June 2019 applies to this Seafood Tower during both lunch and dinner. The Snapper Bouillabaisse (S$36) is a Provencal fish, packed with red snapper, mussels, tiger prawns and clams. The broth is orange and is slightly spicy, packed with herbs and spices along with spicy daikon and lemongrass. I like the fresh flavour of the fish here as well as the hearty seafood broth, which reminds me of the food I had in Marseille few years ago. It is overall not too heavy, highly recommended if you are looking for something lighter for your mains as opposed to red meat. Another signature dish is the Iberico Pork Presa (S$42). Presa is a tender and highly prized muscle within the shoulder, and this pork is actually grilled till medium rare. It is indeed rare for me to hear of a prom being cooked to medium rare. The meat here is tender and comes in a nice red hue. It is served along with sides like star anise, pineapple chutney and celeriac purée which has shreds of pork collar beneath. If you are up for some sharing dish, I highly recommend the Char-grilled Forty Day Aged Rib Chop (S$188) with MBS 6+ and is approximately 1.2kg. The Australian Beef here is slowly chargrilled over Apple Wood, which lends it the aromatic flavour. The huge slab of medium rare beef I had is sliced into rather chunky slices, revealing a beautiful dark red hue. The beef itself is succulent, and I especially enjoyed the slightly charred and dark edges which added to a slight tinge of crisp in terms of texture. Each order of any sharing dish comes with your choice of two sauces and two sides, which include the likes of bearnaise sauce and tarragon emulsion. 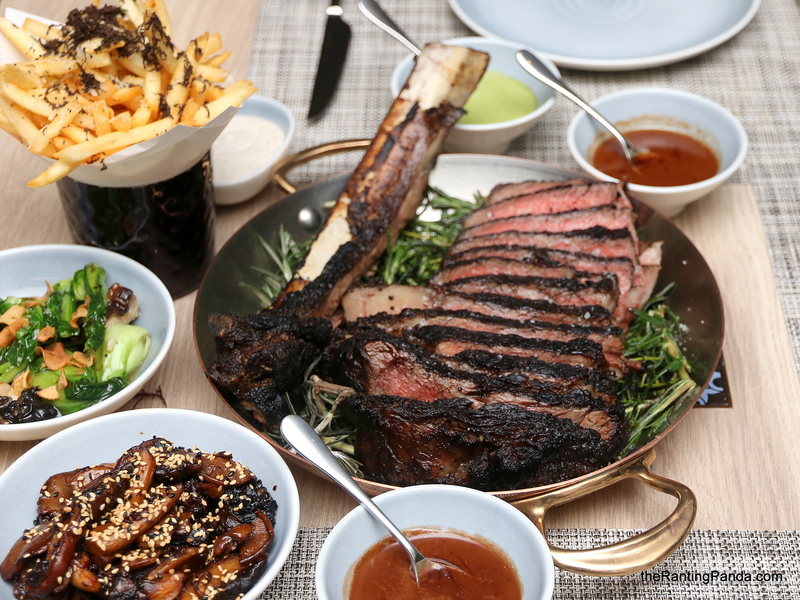 Options for sides include the likes of Black Truffle Fries (S$12), Wok fried Asian greens and Garlic Chips (S$8) and the Wild Mushrooms (S$8) with sweet soy glaze. If you are still up for desserts, there is a dessert and cheese buffet spread during dinner hours which is an additional top up of S$28++ per person. Rants In terms of the dessert buffet spread, there is no one signature item which stands out for me in terms of flavours. Will I Return Again? It is definitely a refreshing uplift in terms of aesthetics for One-Ninety. The dishes are generally competent, which makes it a good option to dine in town.